Happy Friday, it's the end of another week! Mmmm, I'm currently sipping an iced coffee for an extra boost of energy to finish off this last work day of the week. 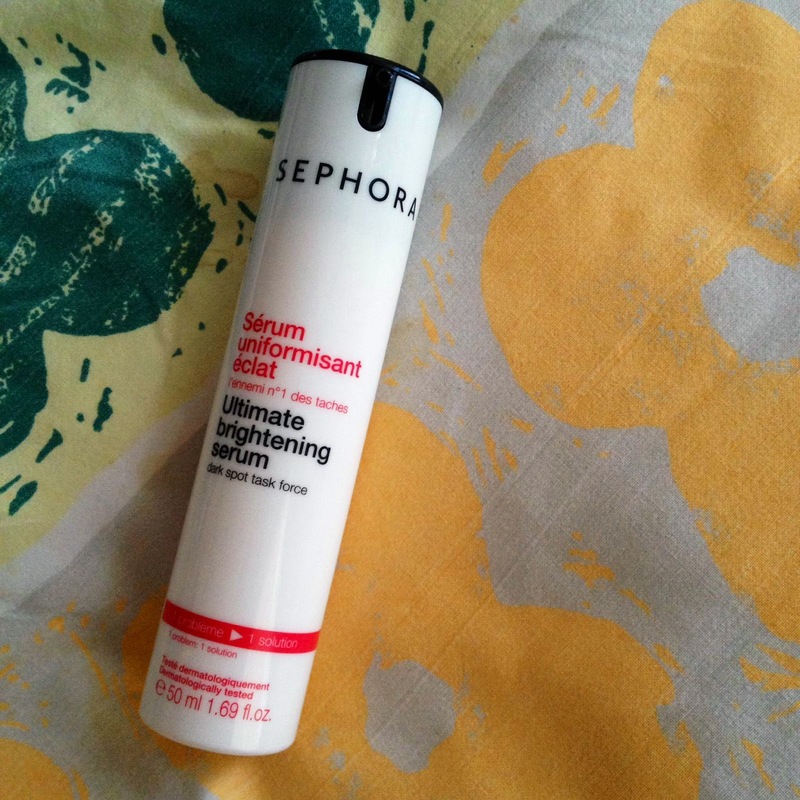 Today I have a review of the Sephora Collection Ultimate Brightening Serum for you. I recently incorporated this into my evening skincare routine (a post on this coming soon!) and it was a great decision to do so. Serums are best used when you're a young adult or more mature. Kids should not be using products like this. It has a very pleasant smell but if you're very sensitive to any kind of fragrance then a different serum may be better for you. This brightening serum helps diminish any discolouration from newly emerging or old skin hyperpigmentation. The discolouration may be in the form of acne scars (which is what I use it for), sun spots, or simply due to aging. The ingredients that help with anti-spots include vitamin C, licorice, brown seaweed extract, and hop plant active. The serum also contains HydroSenn+ which helps moisturize and hydrate the skin by forming a protective film and retaining water. This is formulated without parabens and research has shown that after a few weeks, people saw an improvement in complexion radiance and evenness.This can be used not only on your face, but also your hands, neck, and décolleté. You can use it daily as a part of your morning and evening skincare routine, although I prefer only using it at night. Serum should be used after you cleanse and tone but BEFORE you moisturize. Take a pump of the serum and dab it all over the area for which you're using it. Gently pat the product into your skin until it's absorbed. As stated in the name of the product, this is found at Sephora. Serums generally cost a bit more because it is a specialized skincare product. The original price is $36, however it is on sale right now for $19! That's a bargain you can't miss out on. Since it is on sale most stores may have sold out of the serum. When I went I got the last one in store! However you can still order this online. I love it. After using it for several nights I was able to see that my acne scarring was already starting to fade! It gets absorbed into the skin very quickly and I really like the smell of the product. It comes in a pretty big bottle so it will last for a while. I'm glad to have included this step into my skincare routine because my skin--especially after the previous years of acne, redness and scarring-- needs the extra help in correcting the texture and hyperpigmentation. When I finish this bottle I will probably switch to an anti-aging serum because skin discolouration can only be improved by so much. By the time I finish this serum there will probably be no further diminishing of my spots. If you have any other questions regarding this serum, feel free to ask me in the comments below! Thank you Jay! It's great to meet bloggers like you! :) Sorry, I'm still new to this whole blogging thing but what does GFC stand for?